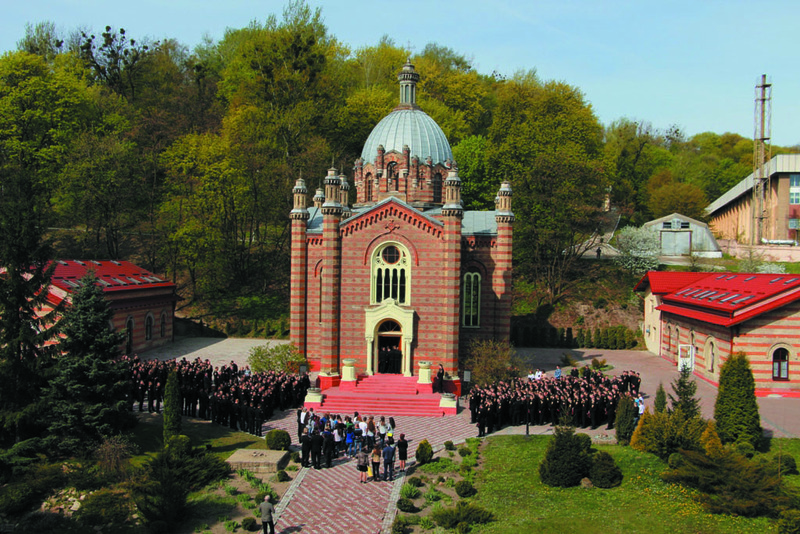 The Virgin of Mercy Church is a perfect addition to the monumental building of of Lviv State University of Life Safety. 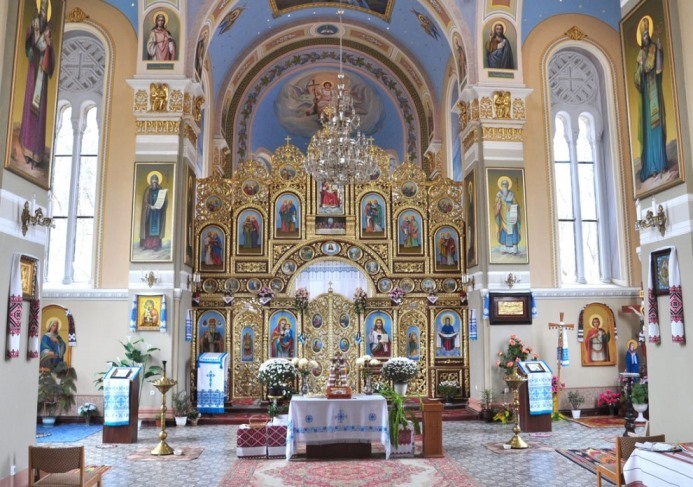 It is decorated with rich decor with Byzantine and Greek forms. The architect Theophil Hansen designed it as a Greek cross inscribed in a square. 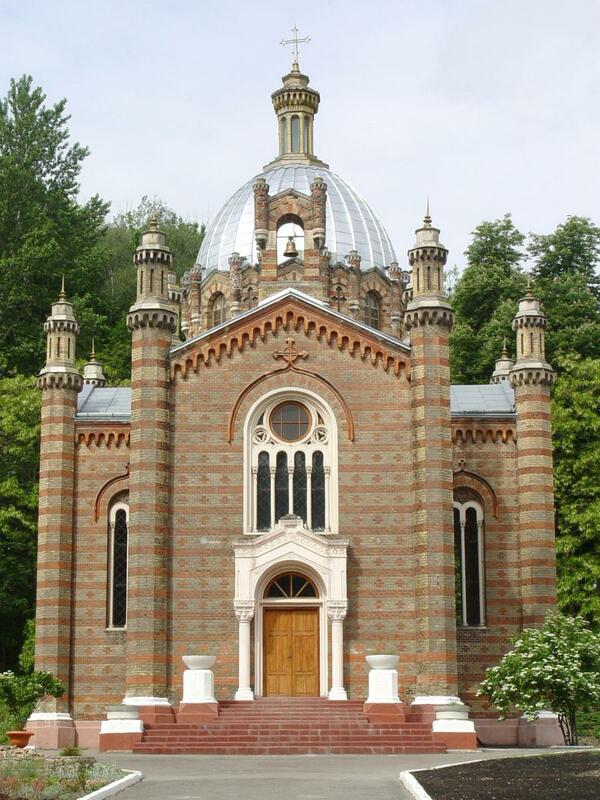 The chapel was built between 1855 and 1863 years in conjunction with the main building. The presbiteriy is closed with an apse. Byzantine decoration has modified character. The mood.is enhanced by the color contrast of the brick (red and yellow). The sculptural ornaments,unfortunately, have not survived to nowadays. The entrance to the chapel was decorated with four magnificent sculptures of Faith and Religion and the two apostles - St. Peter and St. Paul. The Crucifixion was fixed above the gate. There were 12 statues of Saints inside the chapel. Choirs and Painting have not survived too. After 1939 the building of the chapel underwent destruction and was used for other purposes – as a clothing warehouse. Art paintings on the walls were roughly luted with the lime, stucco and reliefs were destroyed, the cross on the dome was removed. 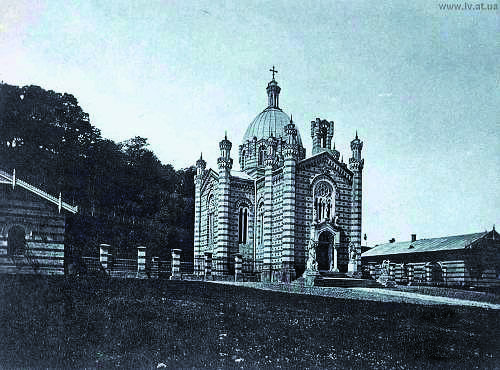 Only in 1993 Rector of the College Colonel of internal service Bohdan Grytsay took the initiative to remove the warehouse to another location and to restore the chapel. In May 1994, student Valentin Ocheretnyy set a cross on the dome of the chapel. Rector of the School announced a fundraising among employees for the restoration of the buildings. They collected 21 million and 11 thousand coupon-rubles. This money allowed mending of the roof. Lieutenant Colonel of internal service V.O. Kaloshyn and Lieutenant Colonel of internal service T.B. 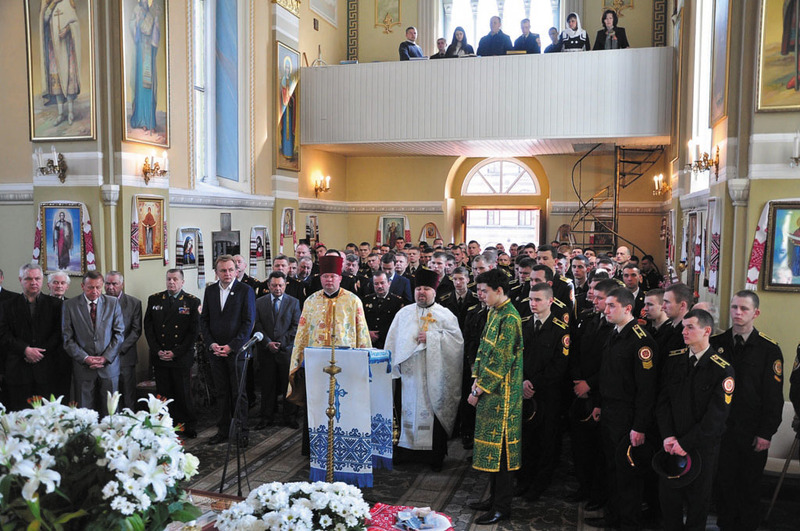 Yuzkiv together with cadets Andrew Monastyrskyi and Anatoliy Vitruk restored reliefs and stucco. Cadet Alexander Vakulich together with his father helped to get the material and to complete wood-carving of the Sanctuary doors. Oleg Lozinski and Olexandr Karkavchuk performed the highly laborious job of painting the center of the dome. An iconostasis was manufactured, installed and covered with gold by the team under the guidance of a professional carver p. Zenoviy. The altar was donated by sergeant of internal service V.P. Heletyuk. Amateurs and school masters managed to manufacture ark and tetrapods and to rebuilt choir. The noble cause of spiritual rebirth involved not only the entire personnel of the school, but parents of cadets and graduates. Thus, Igor Rodolitskyi donated 10 mln. coupon-rubles, Olexander Fizer donated towels, Mykola Savostin donated the image of the Virgin with a Child. Graduates of 1996 made candlesticks, graduates of 1997 donated a central chandelier, and graduates of 1998 donated felon and incense. 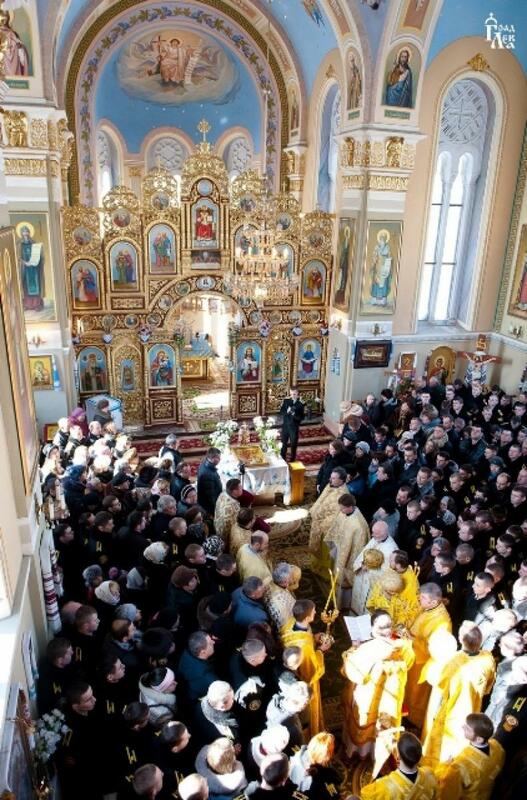 On October 11, 1998 the Metropolitan of Lviv and Sokal Andrew consecrated the chapel as the Virgin of Mercy Church by the canons of Ukrainian Orthodox Church. 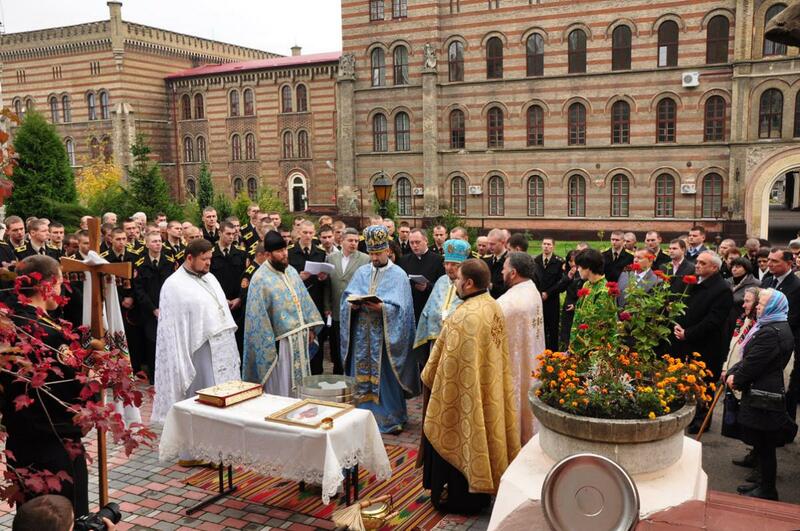 Today the Church is the centre of spiritual life of the University. Liturgical services are held on Sundays and public holidays, involving not only cadets and students but also all interested persons.